Anyway, your info is appreciated! At most, we have a better picture and details about these fine items!! At least, this eBay auction displays very good reference material about this prop... Well done, Photek ! 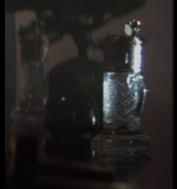 just to clarify (after re-reading what i wrote), i meant to say these appear to be the same decanters as those used in the film - and not the actual screen-used items. $2,500 .... Ridley strikes again!